Another project has been completed around here. Watch out, I’m on a roll. I’m so happy to present to you my new lampshade! I bedazzled it with burlap (burlazzled? 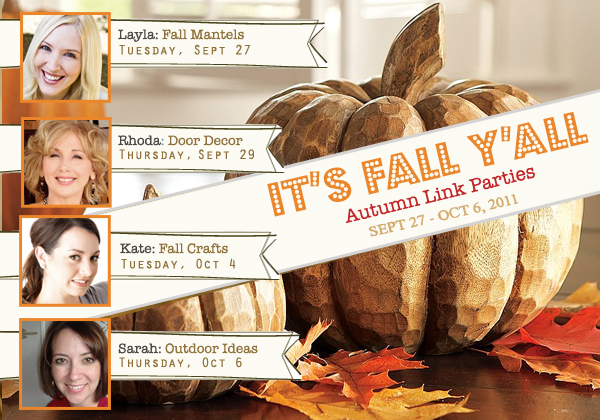 ), just like my fall mantel. 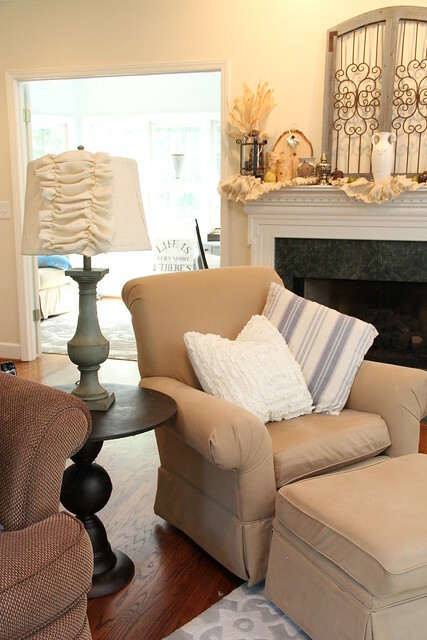 Remember my Pottery Barn knockoff lamps that I scored at Homegoods a few months ago? I finally got around to recovering the ugly lampshades that came with them. Let me say that I came very very close to spending $60 on a pair of new burlap shades on several different occasions just to mark that off my to-do list. But now I’m glad that I waited. 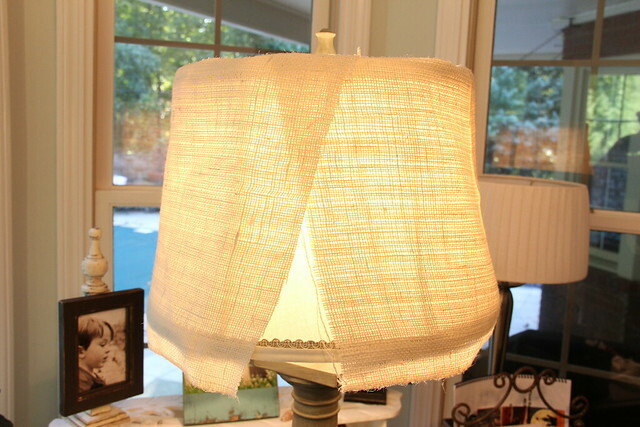 Last night I got out the burlap, scissors and hot glue gun and just went to town recovering the lampshades. And they turned out AWESOME, if I do say so myself. I didn’t have an exact plan for this project, I just winged it and snapped photos along the way. Here is where I started by hot gluing several pieces of burlap onto the shade. Nothing hard about that, right? 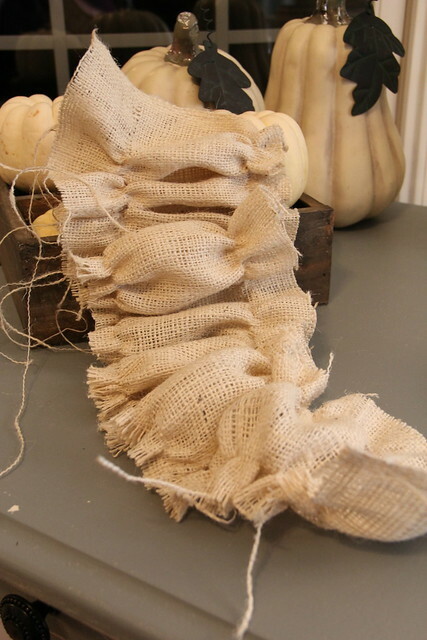 Cut burlap, hot glue around edges. Just make sure to leave some excess to wrap around the bottom of the shade. Once I got it wrapped up most of the way I had this gap left over because of the shape of my shade. I was going to just slap another piece of burlap on top and call it done, but that seemed kinda plain to me. 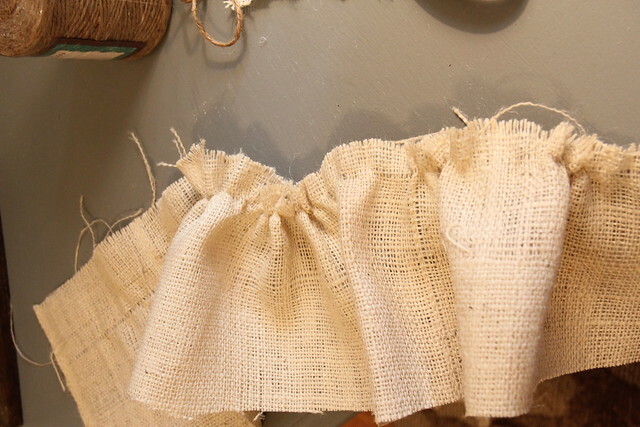 I wanted something else, so I decided to make a burlap ruffle to cover up the unfinished part. 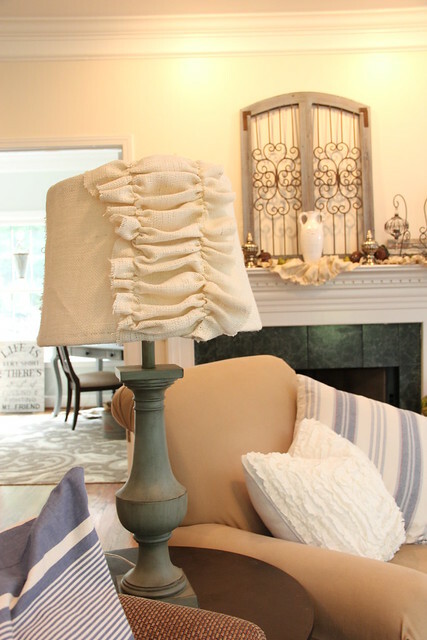 I will show you how to make the ruffle in just a second, but I wanna show the finished lamp first. Once I got the ruffle made I just simple hot glued it onto the shade. So easy, and so fun. It really dressed up this lampshade a lot. I’m so happy with the end result. Much better than a $30 plain-jane burlap shade from Pottery Barn, dontcha think? It’s so imperfect and rustic but girly and pretty all at the same time. I have to say I didn’t come up with the idea for burlap ruffles on my own. 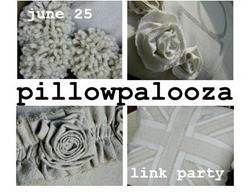 A few months ago I bought a pillow made by Jaime at Home and Soul Redemption from the Alabama Goods store in Homewood. 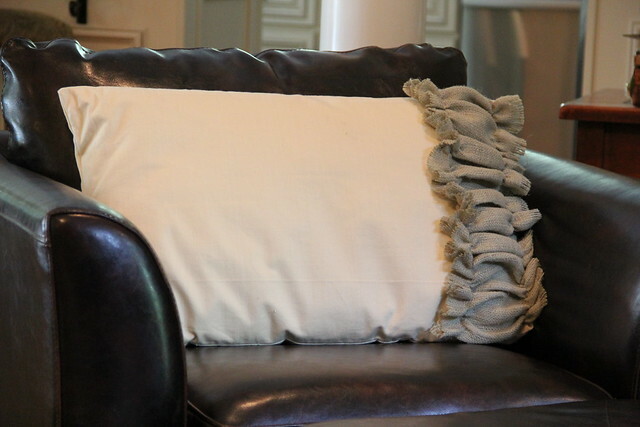 The pillow had a beautiful burlap ruffle on it that I just fell in love with instantly. I knew I could make something like it myself, but I didn’t realize just how easy it would be. 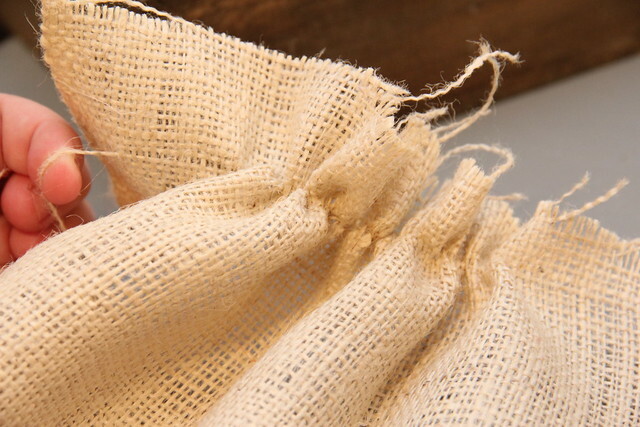 First, cut a long strip of burlap about 6″ wide. 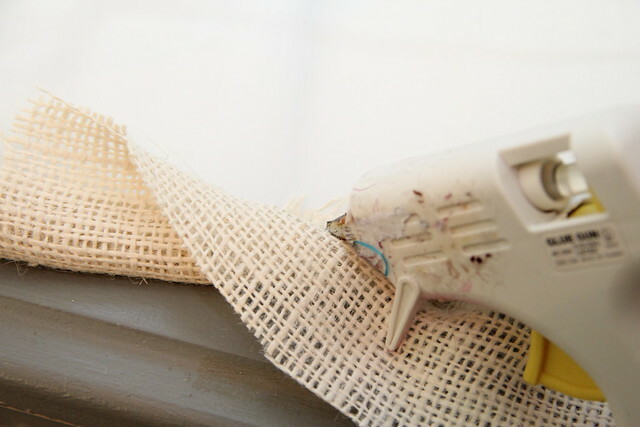 Take your scissors and snip one single strand of the twine about 2″ from one side of the edge. 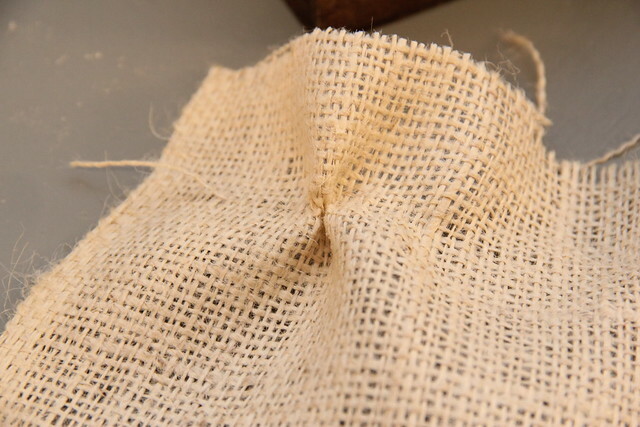 Then just start pulling and gathering the burlap along that one strand so that it starts bunching up on itself along one side. 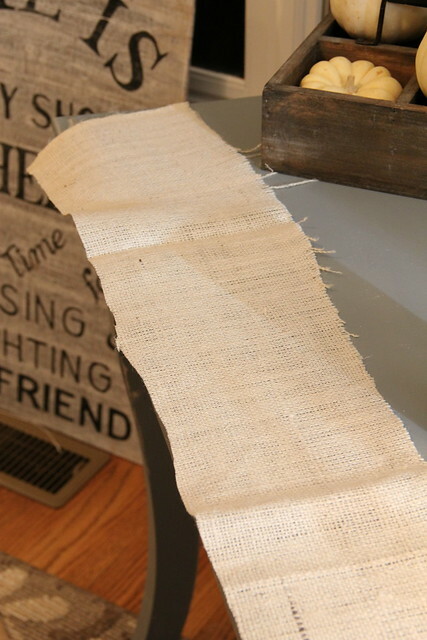 …Until you have the entire length of the burlap strip gathered up. This is also a good thing to do if your string breaks along the way. 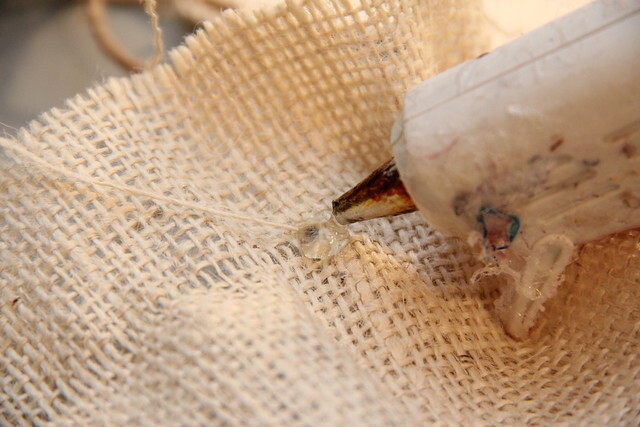 Glue down the part that is gathered, then just grab another strand beside that one and start pulling again. You’ll eventually get it all gathered up. It doesn’t have to be perfect. Once you finish one side, do the other side the same way. You’re gonna have all sorts of fuzz and strings hanging off the ruffle, so just give it a quick haircut before you use it. Warning: The front of my shirt was COVERED in burlap lint during this craft night, so be sure to wear an old shirt for this project. 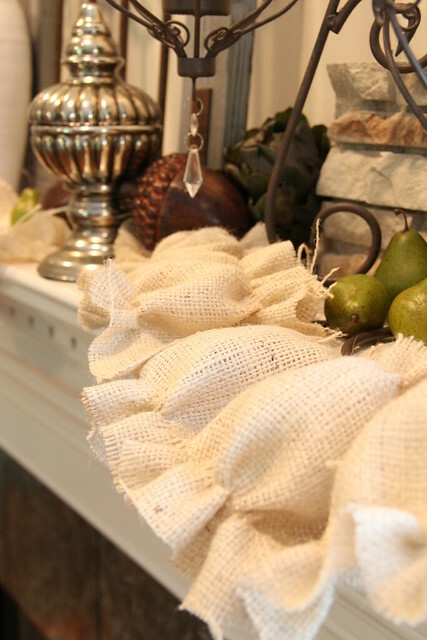 Once you have several strips ruffled up, you can just hot glue them end to end to create a long runner or garland out of them. 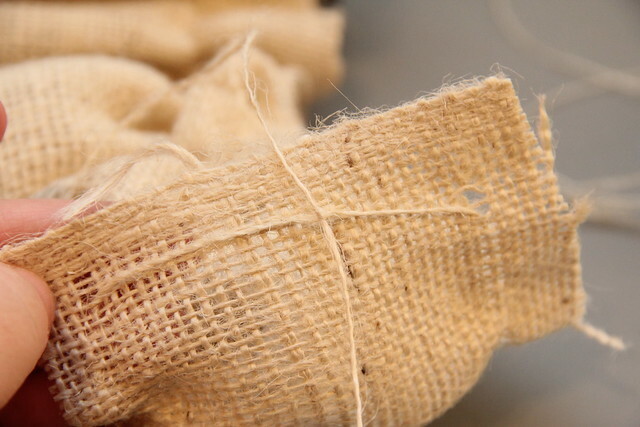 The hot glue doesn’t show up on the burlap so just glob it on there really good. Nobody will notice. If you don’t have a hot glue gun then you can just tie a knot in the two threads once you get to the end of a run. 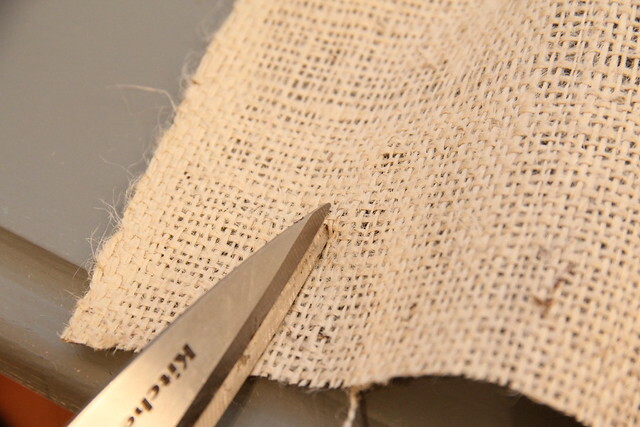 Or, if you’re a perfectionist you could always sew them end to end with a needle and thread. I’m not a perfectionist. Heck you could even make yourself a really itchy scarf or camera strap outta this stuff! Be creative! 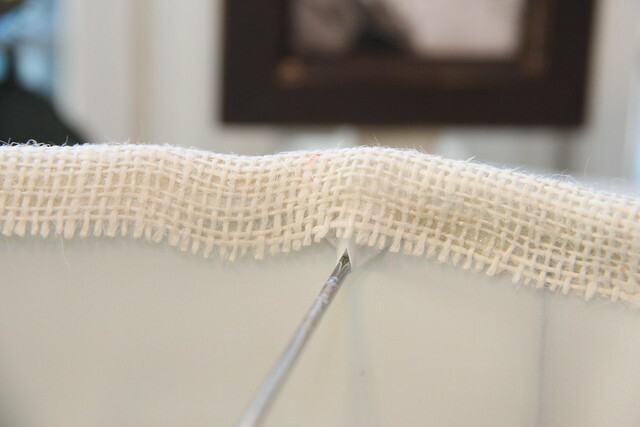 I was really amazed by how easy–and kinda fun, for all you sweater string pullers out there–this project turned out to be. 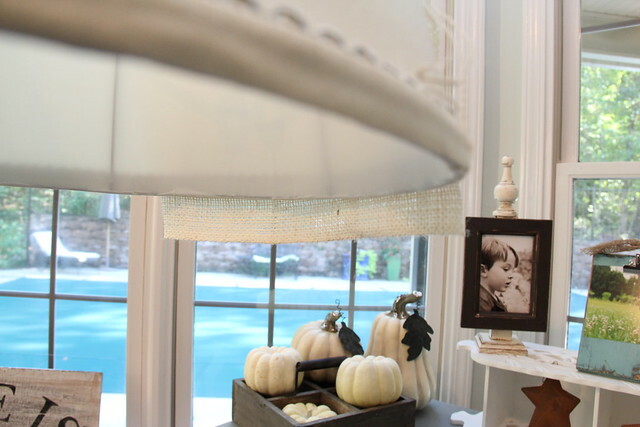 If I get to feeling REALLY crafty, I might even add a few of these super cute DIY fabric flowers made from burlap to the other side of the lamp for a little more pizzazz! Too cute Beth! 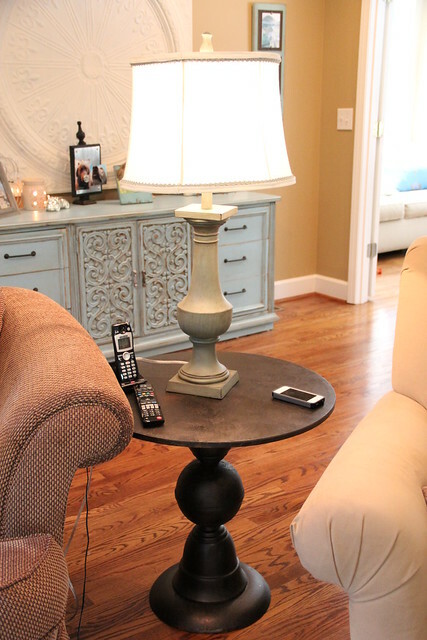 I love that the mix of girly and rustic, perfect for you! Love!! I don’t know which I like more, the lamp shade or the pillow! Genius Beth, and can I say I literally LMAO at your title for this post! TOO FRICKEN CUTE! 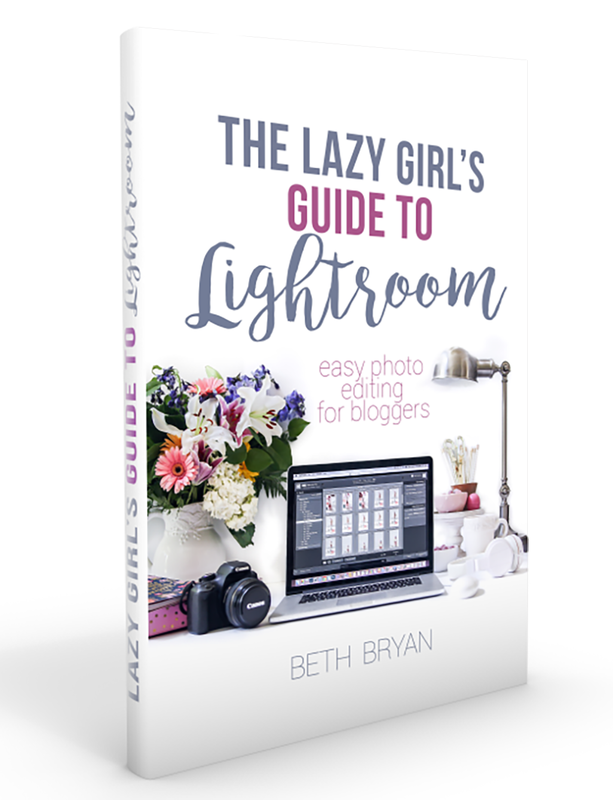 Beth – ok now you are just showing off!!! LOL – just kidding, you really are on a roll! I love your tutorial, you made it look easy. The effect is nothing short of amazing – the texture of the fabric brings so much, I never would have thought that about plain old burlap. Now – can you come to my house and do that for me??? Looks beautiful – Happy Fall to you and your family! 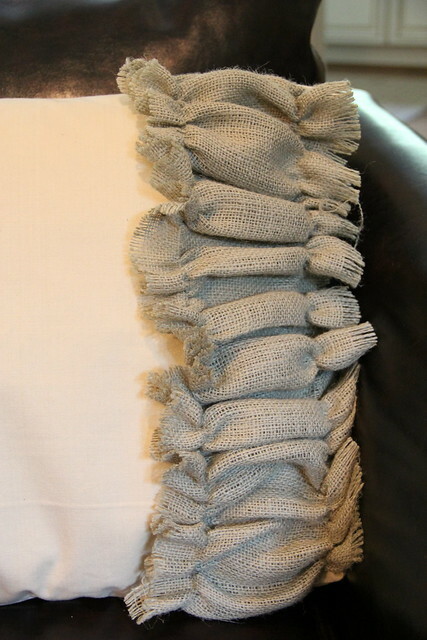 I loved your tutorial on how to make the burlap ruffle! 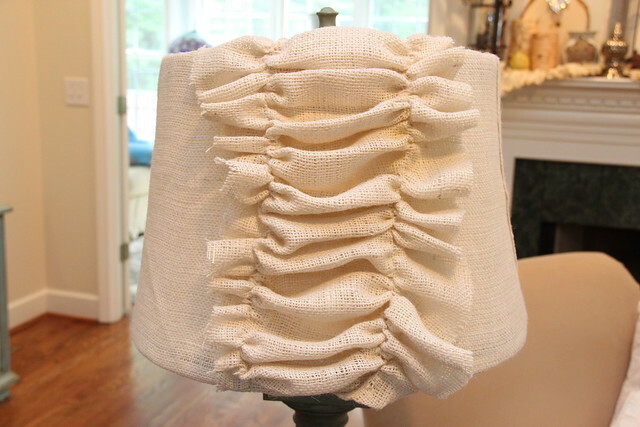 I’m going to cover a lampshade in burlap soon, and it would be so cute to put a ruffle on a pillow, too.